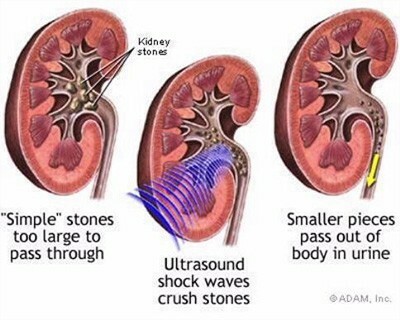 Extracorporeal Shock Wave Lithotripsy (ESWL) is the least invasive surgical stone treatment using high frequency sound waves from an external source (outside the body) to break up kidney stones into smaller pieces, and allow them to pass out through the urinary tract. Recent concerns regarding increased longer term risks of developing high blood person (hypertension) and diabetes remains an area of contention due to tissue injury to the kidney and pancreas. As ESWL is performed under sedation or general anaesthesia, you should have nothing to eat or drink for 6 hours prior to treatment. Regular medications can be taken with a sip of water with the exception of blood thinning agents (eg. warfarin, aspirin, clopidogrel) or non-steroidal anti-inflammatories which need to be stopped for 7-10 days. A mid stream urine (MSU) test is required to ensure the urine is sterile before any treatment is undertaken. Your procedure will be performed either under sedation or general anaesthesia depending on your situation. You will lie on a special operating room table containing a water-filled cushion that allows high frequency sound waves to be transmitted to the kidney. X-rays or ultrasound are used during the procedure to precisely locate the stone, and assess the effectiveness of stone fragmentation. Bleeding around the outside of the kidney from the shock waves bruising the tissues. After ESWL, stone fragments usually pass in the urine for up to several weeks after surgery and may result in mild pain. Occasionally, you will need further ESWL or other minimally invasive stone treatments to complete stone clearance. Strain all urine in the first 48 hours after surgery, and bring the fragments to your doctor in a dry container for stone analysis. You need to drink 8 to 10 glasses of fluid per day to aid the passage of stone fragments. You will be reviewed in the office after 1 month. A KUB (Kidneys, Ureter, Bladder) x-ray should be done just prior to seeing the doctor. Simple analgesics such as Panadol are usually all that is required, occasionally stronger medication (eg. Panadeine Forte) may be necessary. You will not be able to drive for at least 24 hours after surgery if you have the procedure performed under a general anaesthetic. Click here to download Extracorporeal Shock Wave Lithotripsy info sheet.